This is a scalable context timeline. 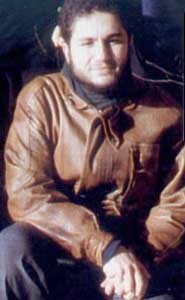 It contains events related to the event Late 1997-Early 1998: 9/11 Hijacker Atta Disappears from Germany for Months; He Possibly Trains in Afghanistan with Bin Al-Shibh. You can narrow or broaden the context of this timeline by adjusting the zoom level. The lower the scale, the more relevant the items on average will be, while the higher the scale, the less relevant the items, on average, will be. The Woodland Park Resort. [Source: Woodland Park Resort]9/11 hijacker Mohamed Atta takes flying lessons in the Philippines, and 9/11 hijacker Marwan Alshehhi is with him. They stay at the Woodland Park Resort Hotel near Angeles City, which is about 60 miles north of Manila and near the formerly US controlled Clark Air Base. Victoria Brocoy, a chambermaid at the hotel, will later claim that Atta stayed at the hotel for about a week while he learned to fly ultra-light planes at the nearby Angeles City Flying Club. [Gulf News, 9/29/2001; Gulf News, 10/2/2001] She also says, “He was not friendly. If you say hello to him, he doesn’t answer. If he asks for a towel, you do not enter his room. He takes it at the door.… Many times I saw him let a girl go at the gate in the morning. It was always a different girl.” [International Herald Tribune, 10/5/2001] Atta stays with some other men who call him Mohamed. She recalls that one of them is Marwan Alshehhi, who is treated like Atta’s sidekick. However, there are no recollections of Alshehhi going to the nearby flight school. [Manila Times, 10/2/2001; Gulf News, 10/2/2001] She says Atta was hosted by a Jordanian named Samir, who speaks Filipino and runs a travel agency in Manila. 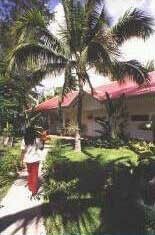 She adds that many Arab guests stayed at the hotel between 1997 and 1999, and Samir always accompanied them. Samir denies knowing any of the hijackers. [Gulf News, 9/29/2001; Manila Times, 10/2/2001; International Herald Tribune, 10/5/2001] The Philippine military will later confirm that Atta and Alshehhi were at the hotel after finding four other employees who claim to have seen them in 1999. Other locals, such as the manager of a nearby restaurant, also recall seeing them. [Philippine Star, 10/1/2001; Gulf News, 10/2/2001; International Herald Tribune, 10/5/2001; Asia Times, 10/11/2001] Atta and/or Alshehhi were seen at the same resort in 1997 (see 1997) and will return to it later in 1999 (see December 1999). A leader of a militant group connected to al-Qaeda later confesses to helping 9/11 hijacker pilots while they were in this area (see Shortly After October 5, 2005). The presentation page of Mohamed Atta’s thesis. [Source: Serra Antoine / Corbis]After future 9/11 hijacker Mohamed Atta completes his master’s degree in Hamburg, Germany, he goes home to Cairo, Egypt, one last time. By this time, his parents are estranged from each other. His father tells Atta they should find him a wife, and has a potential bride lined up. According to his father, they visit a family, Mohamed meets the daughter and they like each other. The woman’s parents also likes Atta, but their only condition to the marriage is that their daughter doesn’t have to leave Cairo. Mohamed gets engaged to her, and then goes back to Germany. According to Mohamed’s aunt, Mohamed asks his mother, who is ill, whether he can remain in Egypt permanently, to begin a career and care for her. However, she insists he continue his education and go on to a doctoral program in the US. [Los Angeles Times, 1/27/2002; Los Angeles Times, 9/1/2002] There have been no reports that Atta ever gets married. 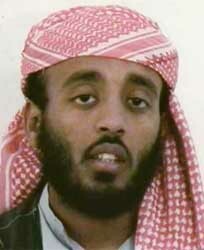 9/11 hijacker Mohamed Atta enters a lottery for permanent resident status in the US. The application is submitted over the Internet to the National Visa Service, a company that, for a $50 fee, helps individuals enter green card lotteries for permanent resident status in the US. Atta submits another lottery application in November, but both applications are unsuccessful. [US District Court for the Eastern District of Virginia, Alexandria Division, 7/31/2006, pp. 19-20 ] This may indicate that Atta is already involved in the 9/11 plot in some way prior to December 1999, when the 9/11 Commission suggests he joins the plot (see Late November-Early December 1999). He appears to have traveled to Afghanistan (see Late 1997-Early 1998) and has discussed studying in the US with his parents (see October 1999). In addition, he and fellow Hamburg cell member Marwan Alshehhi may have already started taking flying lessons (see April 1999 and October 1999). A taxi driver from Bavaria, Germany, will tell police after 9/11 that in April 2000 or April 2001 he drives three Afghans from Furth, Germany, to meet future 9/11 hijacker Mohamed Atta in Hamburg. According to Focus, a German newsweekly, Atta pays the approximately $650 taxi bill. Police will later determine the identities of the suspicious passengers. One of them, aged 44, trained as a pilot in Afghanistan. His 33-year-old brother is another passenger. The brother has military training and has just come back from the US. No details of the third man will be made public. Video tapes, aviation papers, and documents that are confiscated in their house will be investigated after 9/11. [Focus (Munchen), 9/24/2001] The BBC will also report on this taxi ride two months after Focus does. But in the BBC version, the taxi ride happens in April 2001. The taxi driver, Karl-Heinz Horst, will be interviewed by the BBC. He will say that at one point the taxi goes by a road accident with injured people on the ground, and one of the men in the taxi jokes that he’d seen plenty of dead bodies in Afghanistan when he was a soldier there. Horst will also mention that the man who tells the dead bodies joke jumps out and hugs Atta when they arrive at the Hamburg railway station where Atta is waiting for them. [BBC, 12/12/2001] In mid-2002, Al Jazeera reporter Yosri Fouda will allegedly interview 9/11 mastermind Khalid Shaikh Mohammed (KSM) in Pakistan (see April, June, or August 2002). He will later claim he asked KSM about this taxi ride. KSM neither confirms nor denies that he was the third man in the taxi. A 2003 book co-written by Fouda will also say the taxi ride takes place in April 2001. [Fouda and Fielding, 2003, pp. 137] It will be claimed that KSM is in Italy for three weeks in early 2000 (see Early 2000). In a later interview, would-be hijacker Ramzi bin al-Shibh claims that on this day 9/11 hijacker Mohamed Atta calls him (he is in Germany at the time) from the US (see April, June, or August 2002). Atta asks him what is “two sticks, a dash and a cake with a stick down?” The answer, which bin al-Shibh figures out, is “11-9” —the European and Arabic way of writing 9/11. [Knight Ridder, 9/9/2002; CBS News, 10/9/2002] Now knowing the date of the attack, bin al-Shibh later claims that he orders active cells in Europe, the US, and elsewhere to evacuate. According to a later interview with would-be hijacker Ramzi bin al-Shibh, a courier sent by bin al-Shibh tells Osama bin Laden on this day when the 9/11 attacks will take place. [Australian, 9/9/2002] However, there are doubts about this interview (see April, June, or August 2002). 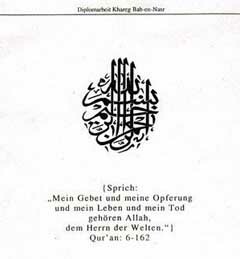 The message may have been taken from bin al-Shibh in Germany to Pakistan by al-Qaeda Hamburg cell member Zakariya Essabar (see Late August 2001). Some commentators will question whether the person in the video is actually bin Laden (see December 13, 2001). Ramzi bin al-Shibh. [Source: FBI]It is originally reported that Al Jazeera reporter Yosri Fouda interviews 9/11 mastermind Khalid Shaikh Mohammed (KSM) and 9/11 associate Ramzi Bin al-Shibh at a secret location in Karachi, Pakistan, in either June [London Times, 9/8/2002] or August. [Guardian, 9/9/2002] Details and audio footage of the interview come out between September 8 and 12, 2002. The video footage of the interview al-Qaeda promised to hand over is never given to Al Jazeera. [Associated Press, 9/8/2002] Both figures claim the 9/11 attacks were originally going to target nuclear reactors, but “decided against it for fear it would go out of control.” Interviewer Fouda is struck that KSM and bin al-Shibh remember only the hijackers’ code names, and have trouble remembering their real names. [Australian, 9/9/2002] KSM, who calls himself the head of al-Qaeda’s military committee and refers to bin al-Shibh as the coordinator of the “Holy Tuesday” operation, reportedly acknowledges “[a]nd, yes, we did it.” [Fouda and Fielding, 2003, pp. 38] These interviews “are the first full admission by senior figures from bin Laden’s network that they carried out the September 11 attacks.” [London Times, 9/8/2002] Some, however, call Fouda’s claims into doubt. For example, the Financial Times states: “Analysts cited the crude editing of [Fouda’s interview] tapes and the timing of the broadcasts as reasons to be suspicious about their authenticity. Dia Rashwan, an expert on Islamist movements at the Al-Ahram Centre for Strategic Studies in Cairo, said: ‘I have very serious doubts [about the authenticity of this tape]. It could have been a script written by the FBI.’” [Financial Times, 9/11/2002] KSM is later variously reported to be arrested in June 2002, killed or arrested in September 2002, and then arrested in March 2003. After this last arrest report, for the first time Fouda claims this interview took place in April, placing it safely before the first reports of KSM’s capture. [Guardian, 3/4/2003; CTV Television, 3/6/2003] Bin al-Shibh also gets captured several days after Fouda’s interview is broadcast, and some reports say he is captured because this interview allows his voice to be identified. [Observer, 9/15/2002; CBS News, 10/9/2002] As a result, Fouda has been accused of betraying al-Qaeda, and now fears for his life. [Independent, 9/17/2002] As the Washington Post states, “Now Al Jazeera is also subject to rumors of a conspiracy.” [Washington Post, 9/15/2002] Yet after being so reviled by al-Qaeda supporters, Fouda is later given a cassette said to be a bin Laden speech. [MSNBC, 11/18/2002] US officials believe the voice on that cassette is “almost certainly” bin Laden, but one of the world’s leading voice-recognition institutes said it is 95 percent certain the tape is a forgery. [BBC, 11/18/2002; BBC, 11/29/2002] It will later be revealed that details of the interview were told to the CIA in mid-June 2002, which directly resulted in bin al-Shibh’s arrest a few months later (see June 14, 2002 and Shortly After). 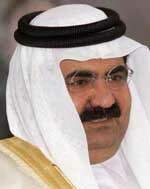 Sheikh Hamad bin Khalifa al-Thani. 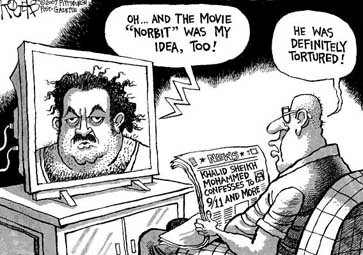 [Source: Qatar embassy]Al Jazeera reporter Yosri Fouda recently interviewed 9/11 figures Ramzi bin al-Shibh and Khalid Shaikh Mohammed (KSM), though there are conflicting accounts about whether the interview took place before or after KSM was publicly identified as the 9/11 mastermind (see April, June, or August 2002). Author Ron Suskind will later claim in the book The One Percent Doctrine that on June 14, 2002, Fouda went to his superiors at Al Jazeera’s headquarters in Qatar and told them about the interview. He speaks to Sheikh Hamad bin Thamer al-Thani, the chairman of Al Jazeera and the cousin of the emir of Qatar, and a few others. At this time, the US is intensely pressuring the Qatari government to get Al Jazeera to tone down what the US perceives as anti-American news coverage. In fact, it is widely believed in Qatar that the US deliberately bombed the Al Jazeera office in Kabul, Afghanistan, in November 2001 to send a message. Perhaps as a result of this pressure, a few days after Fouda reveals his interview, the emir of Qatar, Sheikh Hamad bin Khalifa al-Thani, tells the CIA all about it. Fouda described some of al-Qaeda’s operational plans and even had a good idea where the apartment was in Karachi, Pakistan, where the interview took place, and what floor he had been on. Suskind claims that “No one, not even Al Jazeera management, knew the emir was making the call” to the CIA. US intelligence begins an intense surveillance of Karachi in an attempt to find KSM and bin al-Shibh (see Before September 11, 2002). Mostly because of this lead, bin al-Shibh will be arrested in Karachi in September 2002, around the time when Fouda’s interview is finally aired in public (see September 11, 2002). [Suskind, 2006, pp. 134-140] Interestingly, in early September 2002, it will be reported that KSM was arrested in an apartment in Karachi on June 16, 2002, which would be right about when the CIA was given this information (see June 16, 2002). In September 2002, articles appear in the Pakistani and Indian press suggesting that 9/11 mastermind Khalid Shaikh Mohammed (KSM) is actually captured on this day in an apartment in Karachi. Supposedly he has been sent to the US, though the US and Pakistan deny the story and say Mohammed has not been captured at all. [Daily Times (Lahore), 9/9/2002; Times of India, 9/9/2002; Times of India, 9/9/2002] Interestingly, it will later be reported that in mid-June 2002 the CIA learned about an Al Jazeera interview with KSM and Ramzi bin al-Shibh (see April, June, or August 2002), and the information passed to the CIA included the apartment building and floor in Karachi where the Al Jazeera reporter believed the interview took place (see June 14, 2002 and Shortly After). The next day, these other safe houses are raided by the ISI (Pakistan’s intelligence agency). 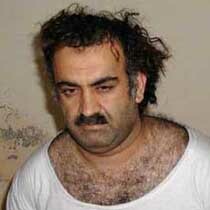 9/11 hijacker associate Ramzi bin al-Shibh is arrested at one of the safe houses (see September 11, 2002). However, in contrast to the claim that the arrest of Ahmed Ghulam Rabbani led to the arrest of bin al-Shibh and others, there is a claim that an Al Jazeera reporter, Yosri Fouda, interviewed bin al-Shibh and KSM in a Karachi safe house in the middle of 2002 (see April, June, or August 2002), then told the emir of Qatar, Sheikh Hamad bin Khalifa al-Thani, where the interview took place, and the emir told the CIA. The CIA then began intensely monitoring Karachi for safe houses, which finally led to these raids (see June 14, 2002 and Shortly After). At another safe house, there is a gun battle when it is raided. Two suspected al-Qaeda operatives are killed. 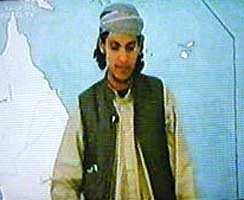 One of those killed, Hamza al-Zubayr, is considered an al-Qaeda leader and the leader of the group in the house. The remaining six are arrested. All six will later be transferred to Guantanamo. [US Department of Defense, 6/25/2008] All of the above is based on Guantanamo files leaked to the public in 2011 by the non-profit whistleblower group WikiLeaks. There are many doubts about the reliability of the information in the files (see April 24, 2011).